If your looking into getting your eyebrows tattooed just because you want them to look tattooed, I’m afraid I cannot be of any service. However, if you are after natural looking eyebrows, we can certainly become great friends. As you might be aware by now, I’m quite an ‘au naturel’ kind of girl…well woman. ‘Microstroking’ is the only reason I decided to take the plunge into the world of semi permanent makeup. This technique produces strokes so fine and crisp that they actually mimic actual eyebrow hair. It is quite similar to the hair stroke cosmetic tattoo using the machine method, however, the strokes are finer and the pigment is not implanted as deeply in the skin. So let’s make this clear and not play with words, as good old faithful ‘Wikipedia’ says: “a tattoo is made by inserting ink into the dermal layer of the skin.” But no one wants to look like Ronald McDonald! Make sure that your artist is officially semi permanent makeup qualified and has been professionally trained. I always like to meet the client before a procedure, to ensure that they are the right candidate for the eyebrow microstroking. Key is to go through a medical checklist to safeguard the client, just in case we need any medical referrals for any conditions. 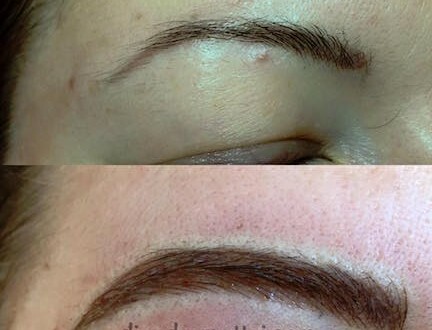 On the day of the procedure we first draw the desired eyebrow shape. 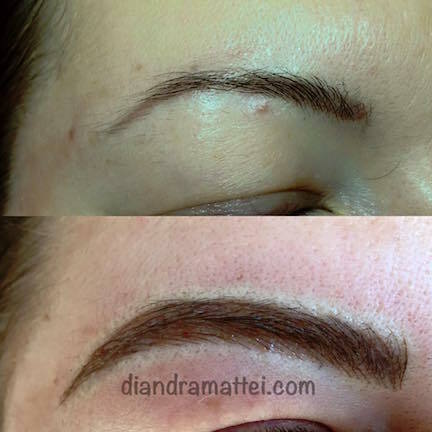 This is to ensure that the client is a 150% sure and happy with the shape of her eyebrows before we start to microstroke. The brow area is numbed and pigment is then implanted into the skin using very fine strokes. Most people experience slight (some say the sensation is similar to getting your eyebrows plucked) to no discomfort. If all precautions are taken there is close to no pain at all. Thin brows caused by over plucking over the years. Since all skin types and lifestyles vary, everybody’s skin reacts differently. The average timeline of the microstroking technique is between 1 and 3 years after that the pigment starts fading. Feel free to email me on info@diandramattei.com with any questions or to set up an apt for a consultation.